Greetings and salutations, everyone; yes, once again it is I, Chess the purebred border collie, filling in for the guy I live with, and here to bring you the latest and greatest news from our garden. You may remember me from such posts as “The Barrow Of Fear” and “Below Normal”, among so many, many others. Here I am in a characteristic pose. 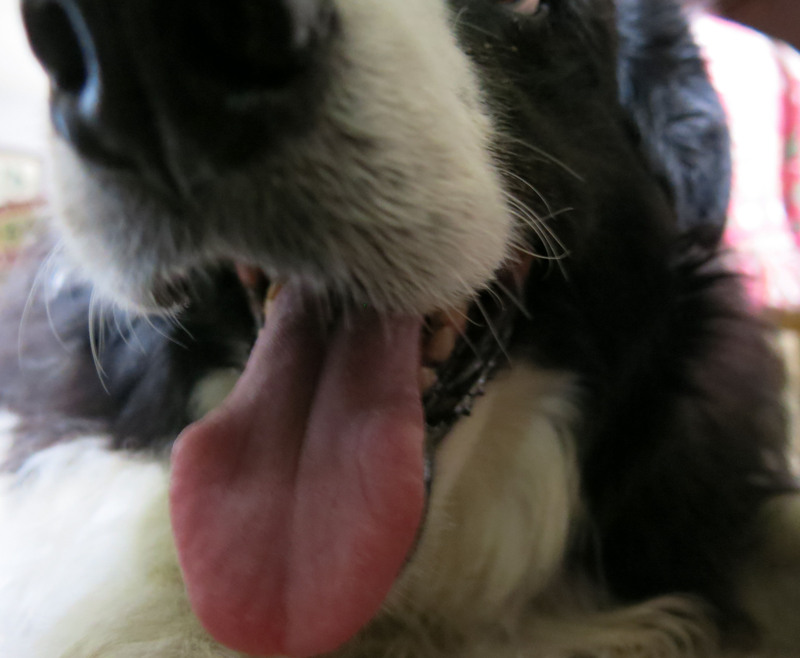 I was hot, and panting, which possibly explains the focus issue. I can’t explain it in the other pictures. Well, practically nothing has been going on lately, except for the guy I live with constantly complaining about the lack of sun here. Oh, and the fact that I’m starting new meds next week and they cost a bundle of money. They’re supposed to help me lose weight. He says I’m worth it, which is good. The weather has been the same here for a very long time. I could post pictures, but they wouldn’t look any different from the last bunch of gray, cloudy, dismal sky pictures I posted. I’m constantly worried that it will thunder and that I might get hit by lightning, but the guy I live with says not to worry. I do anyway. I thought I’d post a picture of our front lawn, to prove that we have one. I’ve shown pictures of it before, but now it’s “peaking”, according to the guy I live with. We have a lawn that peaks. He says the reddish flagstone “strikes a discordant note”. I think he gets that from reading a lot of Graham Stuart Thomas. 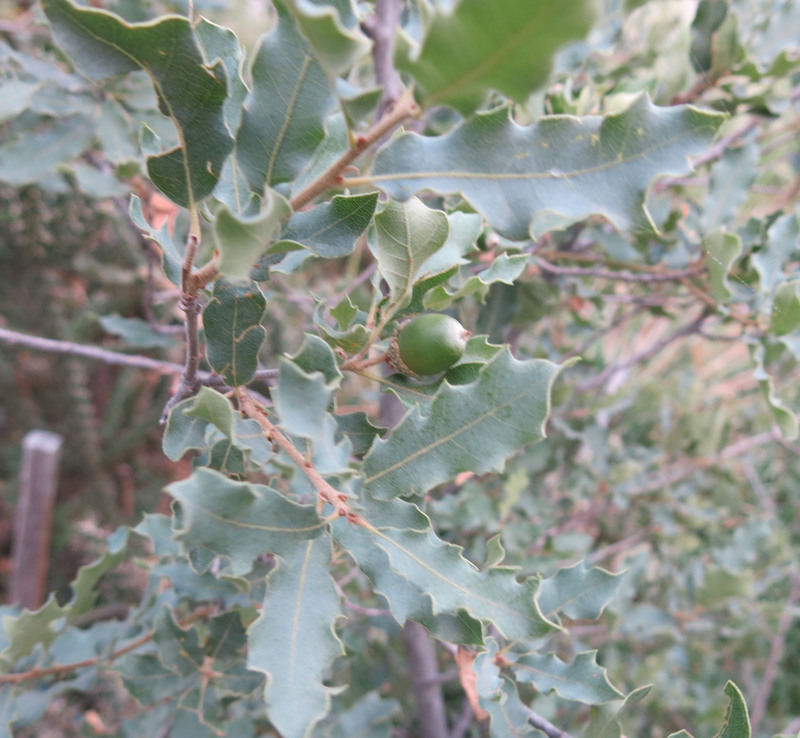 The scrub oaks have acorns on them. For now, of course. They get eaten. But other than that, our days are kind of the same. We like it that way. There has been one change, though, and that happened at night. Late the other night, at Tinkle Time, when I went out into the “way back” with the guy I live with, to tinkle right before bedtime, I heard this noise that sounded like of like “Hghjblblblblblgggghhhhhaaaaa!” Something like that. Then there was a bunch of hopping up and down and much waving of the arms. The guy I live with had walked into one of these. Coming upon a three-foot-long yellow-bellied racer and a four-foot-long bullsnake in the garden were nothing, but this, entirely different story. The guy I live with claimed, later, that all the commotion he made was “an expression of regret for having destroyed such a thing of beauty”. You bet. I’m just glad I’m not that tall. In addition to the initial shock of walking smack-dab into a thing of beauty, Chess, beyond the feeling of being *enwrapped*, is the lasting effect of feeling ghostly remnants clinging, necessitating a constant brushing off of said remnants from one’s person with accompanying shudders. Nothing for it but a hot shower with plenty of lather and clothes tossed in the laundry. Yes, I can recognize a lawn in your front yard, but it’s taken years of indoctrination to feel so. Really, the guy you live with should say (cavalierly) he’s given up a lawn and grows grasses instead. Looks like good romping room for a purebred Border Collie. To ensure the romping, I for one would happily join a Kickstarter fund to Keep Chess in Meds so your excess avoirdupois will melt off. Not that I can see any excess avoirdupois, of course. You do look so cute, Chess, hot and panting. Something to be said for summer after all. Thanks; I forget why I was hot, but certainly not from the sun. The guy I live with says we’ve had about three days with the sun shining all day since the middle of May. 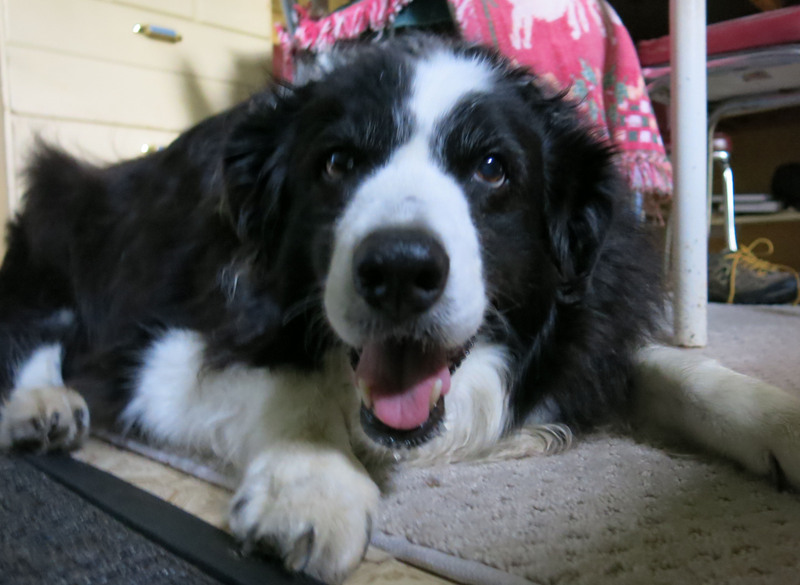 The weather people say we’re “in for a change”, which I, being a rational, highly intelligent purebred border collie, would think means sun all day long, but no, they mean rain. That’s not a change, that’s the same thing. It rained tonight, for a couple of minutes; it rained yesterday, for a couple of minutes, and the day before, and the day before that, etc. Maybe the weather people need to look up the definition of the word “change”…. The guy I live with discovered that he can get my meds online for not quite half what he paid at the pharmacy. He thought about pretending I was his long-lost kid who needed to become a beneficiary. 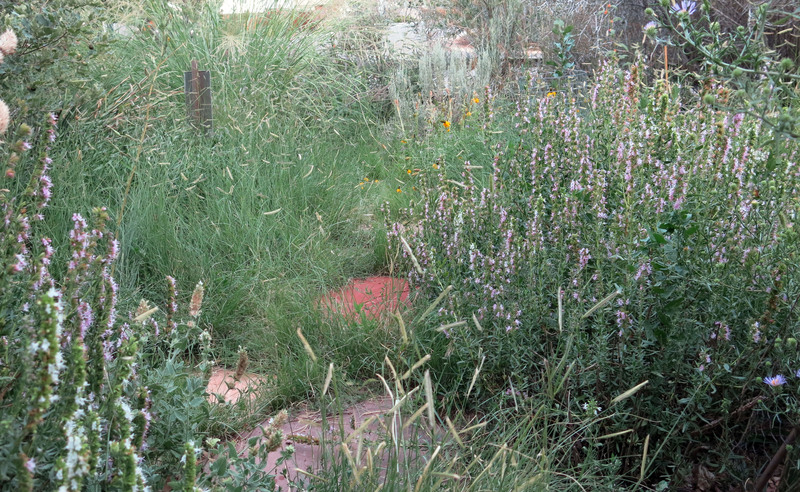 Also, he with insists we have “grassy areas” instead of lawns (not including my lawn out in the “way back”). The front lawn can be mowed with scissors in about five minutes. (In case the neighbors complain, you know.) About the webs. The guy I live with carries a flashlight at Tinkle Time, but forgot to look in front of him instead of at the ground, like he usually does. 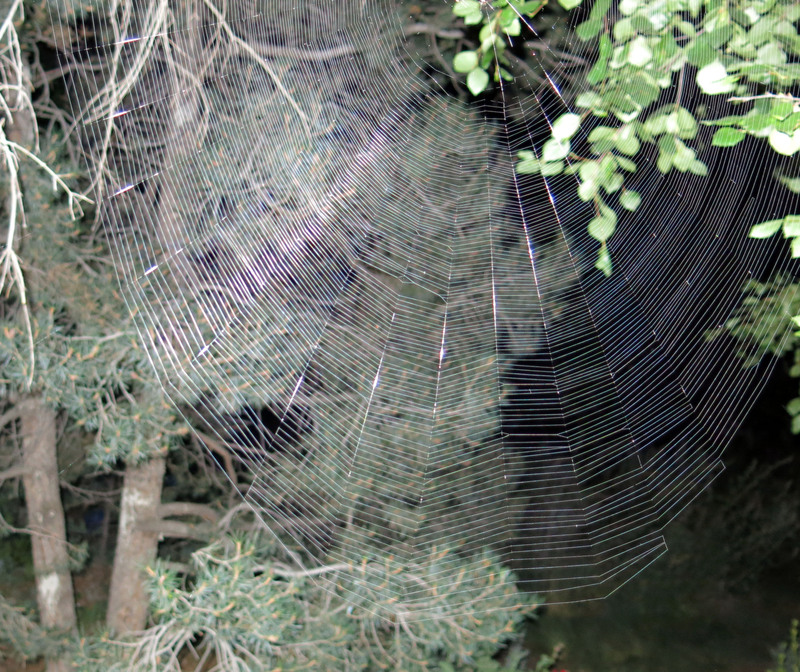 The webs are made by “orb weavers”, which he says are really gross looking, but you have to admit the webs are beautiful. My mommy liked spiders a lot, and one summer (this is really true), since there’s no screen for the back sliding glass doors, there were fourteen orb weavers in the kitchen, on the ceiling, and the house was totally bug-free. I do know how this sounds. These days, such things would not be allowed. Ahh, sorry about the web. I took one down the other day. I was momentarily sad as I spotted the little guy scrambling off on the flagstone:-( Then a few days later I saw he re-built in a much more convenient place; for us both. Our understanding is that the eat the web to make more web. Pretty fascinating watching them do the spinning ….at a distance. Thunder is like a big bully. Mostly bluster, and hardly ever skeleton x-ray making. Love the front “lawn”. Thanks for sharing. Thanks, I agree that thunder is like being bullied. The guy I live with says we’re moving to Seattle so we can see the sun during the summer, which is what’s supposed to happen. Summer=sun, right? We’ve had one day this month with sun all day. Two last month, maybe three. Okay, now, this is funny. Another neighbor is putting in a bluegrass lawn in their front yard. One of the neighbors said their water bill, now that they have a lawn and a sprinkler system, was $200 last month. Our last water bill, and this was when the sprinkler (hose-end) was being set quite a lot to get the new buffalograss seed going in the “way back”, was $69.